The federal government is using data gimmicks to mask the true scope of homelessness. 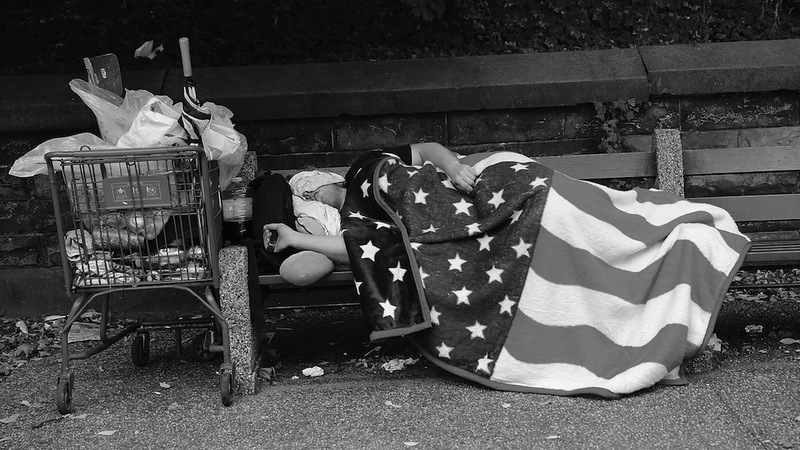 At its annual awards ceremony last month, the National Alliance to End Homelessness (NAEH) honored New York City for leading the nation in reducing homelessness among veterans, apparently cutting it by 64 percent in just three years. NAEH president Nan Roman declared that it was “thanks to cities like New York” that the numbers have concurrently fallen across the US. Yet many anti-homelessness advocates are skeptical, finding it difficult to square the sunny narrative with the moribund economy: income inequality is the worst it has been since the Great Depression, unemployment is still high, and poverty is acute. The discrepancy between the publicized results of the study and those kept buried in its pages is indeed striking, and points to a virtual cover-up of a crisis that the government does not truly intend to solve. New York City may have less than half as many homeless veterans as it did three years ago, but its overall homeless population is hardly on the decline. Over the same period that veteran homelessness fell by nearly two-thirds, the total number of New Yorkers without permanent shelter spiked by one-third. The increase in families without a home was even higher, at 38 percent. Going back to 2002, this latter demographic has mushroomed by an astounding 80 percent. New York City is not alone. Since 2011, Washington, DC has experienced a 21 percent decrease in homeless veterans, but a 41 percent increase in family homelessness and an 18 percent spike in the overall homeless population. In the past year, Chicago celebrated a 43 percent decrease in chronic homelessness at the same time that family homelessness swelled by 11 percent and the total homeless population increased slightly, according to HUD data. At fault for this distorted picture is a federal program called “Opening Doors,” announced by President Obama in 2010 and which aims to end veteran and chronic homelessness by 2016 and family homelessness by 2020. For all other types of homelessness (like temporary homelessness among individuals) the plan aims to “set a path” to a solution. To its credit, the Opening Doors program employs the “Housing First” approach, which flips the previous order of assistance to the homeless by offering them a place to live before trying to solve, say, a housing applicant’s substance abuse problem or mental illness. But the country’s largest cities are trumpeting decreases in select subpopulations of the homeless while playing down the local rise in overall numbers — giving especially short shrift to homeless families. And a more essential controversy bedevils the praise recently heaped on Obama: from the time the federal government began counting the homeless, the numbers themselves have been in dispute. Before the results of the 1990 federal census had come back — the first serious attempt to measure how many US residents were without homes — two of the country’s most prominent radical anti-homelessness activists, Mitch Snyder and Maria Foscarinis, published their own account of the crisis. Their estimate: more than two million individuals. Over the previous decade, advocates like Snyder and Foscarinis had succeeded in winning much of the country to the side of the destitute, calling attention to the crisis of homelessness that had surged with the dismantling of New Deal reforms under Ronald Reagan. But when the US Census Bureau put the number of homeless people at one-tenth of Snyder and Foscarinis’ figures, the media shifted back in favor of austerity, content to brush off what they saw in the streets with the authority of official data. An additional blow to the movement against homelessness was the death of Snyder, who had spent time on the streets himself and who took his own life just months after the census results were released. Images portraying the dignity and resilience of homeless people continued to circulate in street newspapers, alternative newsweeklies, and art houses, but these kind of representations became increasingly rare in television news and daily newspapers. The suicide that year of Snyder, the most well known of the radical anti-homelessness advocates, was interpreted by many as some kind of verdict on the movement itself. Critics of the federal data, however, are still around and still furious — the government’s count of the homeless, though certainly improved, remains flawed. Now conducted annually under the supervision of HUD, volunteers across the country tally up the number of homeless people they find in shelters and in “hot spots” like under bridges and in warehouses on one night in January. The agency doesn’t expect their volunteers to find every homeless person in America on a single winter night, when those turned away from overcrowded shelters are likely hidden away at a friend’s house or splurging on a motel, and has implemented some statistical sampling techniques to compensate. Yet the agency stands by this “point-in-time” count — which, depending on the geographic area, doesn’t always estimate the number of overlooked homeless people and thus produces absurd statistics. For example, in Chicago, a city of 2.7 million, volunteers counted zero chronically homeless people living in families this year. That’s down from six in 2011 — a 100 percent decrease according to their report. Unlike individuals, families without a place of their own tend to avoid shelters or the streets, seeking temporary refuge in cars and motels, or “doubling up” with friends or family. But once they’re off the street or out of the shelter, they’re also off the federal record, leaving an enormous portion of the homeless, or near-homeless, population unaccounted for and therefore unassisted. The Department of Education, to which Nunez owes his statistic on homeless students, includes doubled-up families in its definition of homelessness. Their count, conducted independently of HUD, has consistently recorded higher rates of homelessness. Definitions of homelessness are necessarily restrictive. The category “homeless” would be useless if it had no parameters, and in fact, the term came out of progressive circles in the 1980s as an alternative to the vague and pejorative “vagrant” and “transient.” Unfortunately, this had had the effect of creating a new category of people deserving of aid, while excluding those with slightly different needs, forcing them back into a system where access to housing, health care, and quality education are considered privileges rather than rights. Even well-meaning service providers are caught up in the squabble over who is deserving of a home and who is not. Gowan recounts that she was invited as an expert to a meeting earlier this year by service providers in Minneapolis and St. Paul to brainstorm how to crack down on “scammers” of the housing voucher system. Families who had been living doubled-up or in residences they could hardly afford were moving into local homeless shelters in order to qualify more quickly for housing vouchers. “We’ve created a system where, because we’ve slashed housing subsidies, qualifying yourself as homeless is the primary way to get any help with housing,” says Gowan. But at the same time that the government has facilitated access to permanent shelter for a portion of the homeless, it continues to reduce its stock of subsidized housing for those who aren’t, strictly speaking, homeless, which has lead to seemingly interminable wait lists. In Chicago, for example, the housing authority began accepting new applicants in October after four years of a closed wait list. There are more empty houses in the US than homeless people — many times over. Yet because these properties are largely privately owned, shelters have every reason to worry that the most needy are being sent back to the streets in order to accommodate families with access to alternative shelter. That there is more than one open home for every one of the nation’s homeless underscores the irrationality and immorality of capitalism, of which homelessness is a direct outgrowth. Despite all the bluster of Opening Doors, the Obama administration, like those before it, seems content with a cosmetic approach, its veneer of action facilitated by HUD’s statistical underestimation of the crisis. Homelessness will not be eradicated by engineering data or shifting around funds based on the prevailing definition of who is most deserving. As long as HUD’s budget for building new public housing decreases, as long as housing isn’t recognized as a right, the wait lists will grow along with housing insecurity, whether or not this registers in a head count. And as long as capitalism’s worst symptoms are treated as separate malignancies, to be surgically removed in isolation, we’ll keep passing over the underlying disease. Amien Essif is a regular contributor to In These Times whose work has also appeared in the Guardian and CounterPunch.